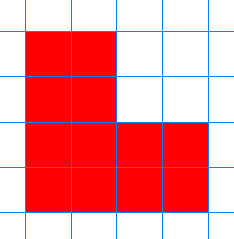 Can you work out how to use the tiling of a size 2 L-triomino to help you to tile a size 4 L-triomino? Click here for a hint. 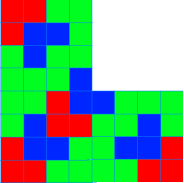 Devise a convincing argument that you will be able to tile a size 8, 16, 32... $2^n$ L-triomino using size 1 L-triominoes. How many size 1 L-triominoes would you need to tile a size 8... 16... 32... $2^n$ L-triomino? What about odd sized L-triominoes? 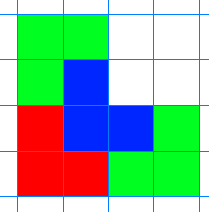 The diagram below shows the region which needs to be tiled to turn a size 1 L-triomino into a size 3 L-triomino. 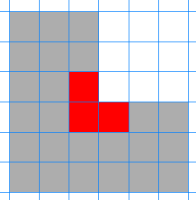 Can you find a quick way of tiling the region, using combinations of the 'building blocks' below? In the same way, can you find a way of adding to your size 3 tiling to tile a size 5? Then a size 7, 9, 11...? Click here for a hint. Devise a convincing argument that you will be able to tile any odd sized L-triomino using size 1 L-triominoes. Combine your ideas to produce a convincing argument that ANY size of L-triomino can be tiled. Here is an interactive you could use to try out your ideas. Inequalities. Quadratic equations. Number theory. Making and proving conjectures. Tessellations. Creating and manipulating expressions and formulae. Networks/Graph Theory. Mathematical reasoning & proof. Generalising. Enlargements and scale factors.